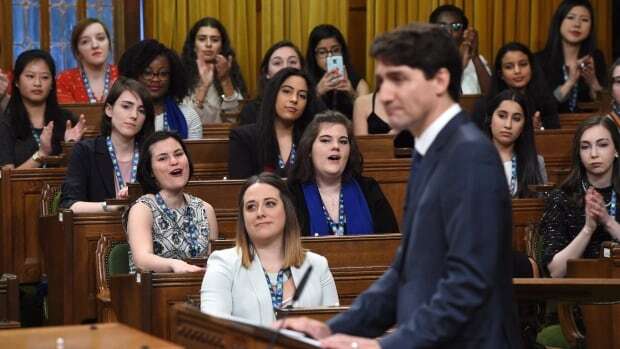 Prime Minister Justin Trudeau could face a boisterous crowd when he delivers a speech to 338 young women later today — just hours after he expelled from the Liberal caucus two women who are former cabinet ministers. The young women, representing every riding in Canada, are in town for the annual Daughters of the Vote summit. The event is organized by Equal Voice Canada, an organization aiming to have more women elected to all levels of political office across Canada. This year’s Daughters of the Vote day falls less than 24 hours after Prime Minister Justin Trudeau expelled Jody Wilson-Raybould and Jane Philpott from the Liberal caucus, saying that trust with the two former cabinet ministers has been irreparably broken. A number of participants have already tweeted their support for the two women. “We are here in Ottawa as young women participating in a conference and we wholeheartedly condemn you ejecting Jody Wilson-Raybould and Jane Philpott from caucus,” tweeted DeannaAllain, representing the riding of Hamilton Mountain. Both Wilson-Raybould and Philpott were spotted in the House of Commons’s gallery for the start of the Daughters of the Vote speeches, which included one from former prime minister Kim Campbell. Trudeau will speak at 12 p.m. ET. CBCnews.ca will carry it live.